In the SEO window, you can update the name, title, description and keywords of all available pages on your ESPWebsite. The checkbox to include include your company information in the SEO decription on browser search results will be checked by default. 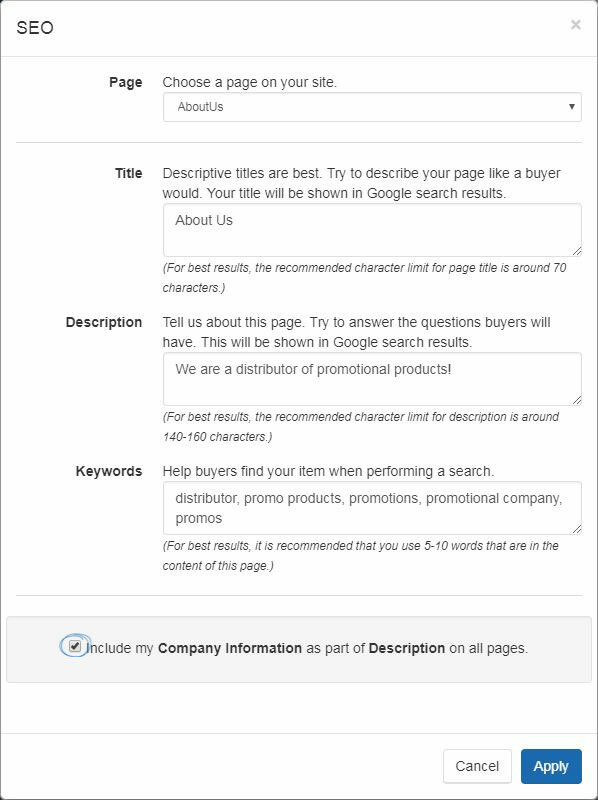 By checking the "Include my Company Information as part of Description on all pages" checkbox, in addition to browser search results displaying the site title and description, the company location will also be displayed. Locate your site and click on the Stats button. Enter your Google Analytics Id in the text box provided. Click on the Save button. If you do not have a Google© Analytics account, please go to: http://www.google.com/analytics/ and create one by clicking on the "Sign Up for Analytics" button on the Google© Analytics home page. For more information on using Google© Analytics, please review the Help section on their official website.